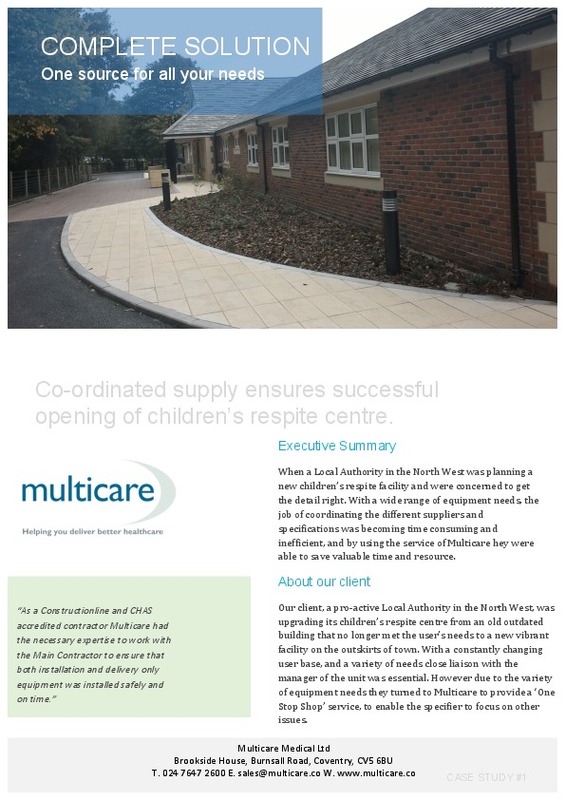 Co-ordinated supply ensures successful opening of children’s respite centre. When a Local Authority in the North West was planning a new children’s respite facility and were concerned to get the detail right. With a wide range of equipment needs, the job of coordinating the different suppliers and specifications was becoming time consuming and inefficient, and by using the service of Multicare hey were able to save valuable time and resource. Our client, a pro-active Local Authority in the North West, was upgrading its children’s respite centre from an old outdated building that no longer met the user’s needs to a new vibrant facility on the outskirts of town. With a constantly changing user base, and a variety of needs close liaison with the manager of the unit was essential. However due to the variety of equipment needs they turned to Multicare to provide a ‘One Stop Shop’ service, to enable the specifier to focus on other issues. As children with very complex cases could attend the respite centre, the care staff had very clear ideas about the equipment they required. Multicare worked with the client to look at new equipment that had been developed since commissioning their existing building, and identified equipment that would fulfill the demanding specification, yet still be compatible with budgets and other design constraints. Multicare developed ceiling hoist designs that covered the bathroom, bedrooms, hygiene rooms and sensory room. The tracks were designed to provide maximum flexibility and coverage to as many areas as possible. In the bathroom a high low bath was specified. To enhance the quality of life for the children, lights, air spa and even bath speakers were specified! Multicare worked with the Main Contractor to supply the relevent equipment at the correct time in the construction process.